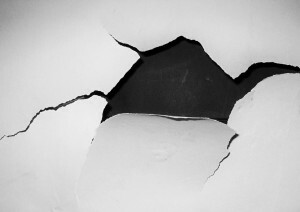 There are quite a few different reasons why your wall may end up with a hole in it. But, more often than not, it is not a happy occurrence. If a hole in your drywall has put a damper on your day, here are a few steps you can take to repair it on your own. If you require professional assistance to get your home back to normal, call Walker & Frick Construction Co. at 804 282 128 for property restoration in Richmond, VA. It's also pertinent to have a piece of cloth, plastic sheets, and a broom and dustpan just in case you need them. The next step is actually protecting the area you'll be working on. It's probable that you don't want to ruin your furniture and the floors in your home during this restoration process, which is why you should employ plastic sheets, newspapers, or other similar materials in order to cover them. This will guarantee that they will be clean and in mint condition for when you're done patching up the wall. It's also likely that you won't want to get yourself dirty during the maintenance task. For that reason, you should also prepare yourself for it. For example, you should wear appropriate clothing: old clothes that you don't mind getting dirty would work well. If you deem it necessary, wear protective eyewear and gloves to keep yourself as safe as possible in the mess. You won't be able to patch the damaged area up if it's dirty and full of loose pieces. That's why, before you begin repairing the drywall, you will have to clean up the area around the hole. To that end, it's recommended that you remove all of the loose drywall pieces that you find. You should also wipe down the spot with a piece of cloth and rubbing alcohol to clean it up. Lastly, try to make the hole as flat as you can so you can repair it properly. Call Walker & Frick Construction Co. at 804 282 128 to get a free estimate on professional property restoration in Richmond, VA.
Now, for the actual fixing of the hole, you will need to grab the repair patch. After reading its instructions and following them thoroughly, put the repair patch over the hole, guaranteeing that it covers it completely. Try your best to ensure that the repair patch is properly sticking to the wall you're repairing, so you don't have any problems with it later down the road. The next step in this tutorial is to apply the drywall compound. Once again, it is highly recommended that you read the instructions to make sure that you do a good job at employing the compound. While you're applying the compound, be certain that you spread it all over the patch. Not only that, but you should make an effort to make the surface even and smooth. If you have trouble with that, don't worry, as it will be addressed in the next step. If, after the drywall compound has dried, you noticed that it's lumpy and uneven all over, then you can make use of the sandpaper to rub the previously damaged area. This way, you can make the repair area mix well with the rest of the wall. Last but not least, you just need to repaint the area. To make the wall good as new, you should do it in a color that exactly matches the rest of your wall (unless you want to paint the whole wall a different color). And once the paint dries, it will be as if nothing ever happened. For property restoration in Richmond, VA, call Walker & Frick Construction Co. at 804 282 128.